If you thought Wall Street was about alpha males standing in trading pits hollering at each other, think again. That world is dead. This is a market that's rigged, out of control and out of sight; a market in which the chief need is for speed; and in which traders would sell their grandmothers for a microsecond. Blink, and you'll miss it. In Flash Boys, Michael Lewis tells the explosive story of how one group of ingenious oddballs and misfits set out to expose what was going on. It's the story of what it's like to declare war on some of the richest and most powerful people in the world. It's about taking on an entire system. And it's about the madness that has taken hold of the financial markets today. You won't believe it until you've read it. My rating is based on a personal interest in the machinations of the financial markets. The drama is often like The Real Housewives of Any City but without the screeching. Michael Lewis as always, makes a droll and difficult subject easy to understand. It is incredible to even consider that the numbers we see, as indications of prices could not possibly be a true reflection of the market and can change in a milliseconds? Who knew that a millisecond could be so profitable? Most of all, it is clear that where a buck can be made, there will always be those who will try to game the system. Any story of a group of disrupters always makes for an interesting read. Along the way, you get to learn some interesting things about stock markets in the age of technology. 4.0 out of 5 starsExcellent, but the end feels rushed. I like Michael Lewis' writing style and his power of description, but even his eloquence is sometimes stumped by the complexity of the issues surrounding High Frequency Trading. That aside, this is a rip-roaring read about Wall Street's latest invention to strip money out of the economy and pensioner's savings without doing any actual work or providing any value in return. 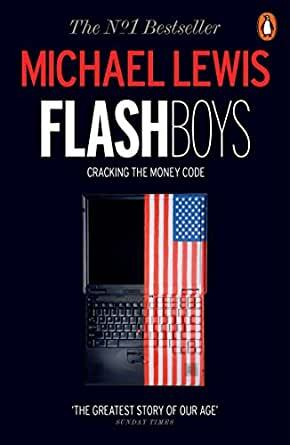 As one of the protagonists of the Flash Boy's story discovers, Wall Street has always been rigged, it's only the "how" that changes. This is the story of the modern day "how", and the people on the "outside" who discovered what was going on, and their quest to correct it. Parts of the book will make your blood boil, others will have you slack jawed at the audacity,hubris and ambition exhibited by the players in this game. But mostly you will be concerned that the world's largest capital markets are being systematically broken for the benefit of a few, the ramifications of which is much larger than the plunder of a few tens of billions of dollars. I follow markets but I'm not qualified to comment as to how factual the case Lewis presents against HFT is or isn't; my perspective is only on the writing. I don't think any subsequent books have managed to be as compelling as Liar's Poker, but I still enjoy pretty much everything that Lewis writes. He does a great job of describing fairly technical fields in relatively simple ways and in finding the human stories in otherwise dry subjects. I'm a technologist who formerly worked in international futures markets when they changed from manual pits to purely electronic, so not all of this was unknown to me, but the scale of the issue is simply breathtaking. If you're a technology person, or a finance person, or simply interested in where your pension fund money has disappeared to, read this tale. It's an eye opener, now I understand the way HFT works and why if affects the return of other investors. While I don't necessarily agree with Michael's arguments that HFT firms are to blame, and hedge funds and mutual funds are innocent victims, the whole picture is becoming a lot clearer after reading this book. This let me know there was a problem. It is to do with split second computer fraud. But I did not come away with a clear understanding of exactly what the cleverest fraudsters in the room really did. ...which of course he can't. Since I was captivated by Liars' Poker back in the eighties, I've read every one of his books. This one has been as great as the rest. Now, what am I going to do until the next?